In simple terms: where you live determines what types of plants you can grow successfully. While this may seem obvious enough it is tempting to think that you can plant just about anything anywhere in Australia. In general, we have a fairly benign climate, certainly where most Australians live (compared to Europe and North America for example). However, we do have distinct climate zones that you really need to think about if you don't want to be frustrated with your plant selections. Poor choices lead to problems with pests and diseases, perhaps excessive demands for watering, premature death of the plant due to high temperature, frost or even high humidity. Ultimately, you won't win in a fight with nature. Tropical 11B Hot humid summer (average max > 30°C). Warm winter. The primary area extends across the north of Australia from Canarvon through Port Hedland, Broome, Darwin and Cairns, and south to Bundaberg..
Sub-tropical 11A Warm humid summer (average max < 30°C, min > 10°C, frosts are rare). Mild dry winter. Includes the eastern seaboard from Brisbane south through Coffs Harbour to Sydney. Also includes coastal WA from approximately Geraldton to Canarvon. It is a mild climate, with low winter rainfall and reliable summer rainfall. Warm Temperate 10 Warm summer, cool winter (average max < 30°C, min > 5°C, with some light frosts). Includes inland Qld, some NSW tableland areas and the coastal region south of Sydney. These zones experience the distinct four seasons. The ocean moderates temperature in coastal areas overlapping this zone with subtropical ones. The rainfall is reliable year round. Mediteranean 10 This zone shares many of the features of the Warm Temperate zone. It includes much of southern coastal Australia from Melbourne, Adelaide through to Perth. Rainfall is predominantly in winter with a low summer rainfall. The summer is warm but with a low humidity. Cool Temperate & Alpine 8-9 Mild or warm summer, cold winter (average annual min 0°C to -5°C, with heavy frosts). Includes high areas of the NSW Northern Tablelands, Southern Tablelands, Canberra/ACT, VIC and most of Tasmania. Spring is a pivotal event and the summer growing season is short. Alpine areas may experience snow. (If you are a registered Australian iGarden member you can check your local climate zone, and get statistical information on rainfall and temperatures, by going to the Local Places/Events page of this site). Of interest, there are climatically similar parts of Southern Africa, Chile, Argentina, Brazil and New Zealand in the Southern Hemisphere, and California, Florida, Mexico, China plus areas around the Mediterranean in the Northern Hemisphere which can be helpful when you wish to start to indentify canditate plant types for your garden. Some plants will happily grow in a wide range of conditions so are adaptable to many climates but this can only be known by trial and error. You have probably seen plant hardiness zone guides especially those used in the US. The published numbers refer to a plants ability to survive the conditions of a particular location, including tolerance of heat, humidity and so on. 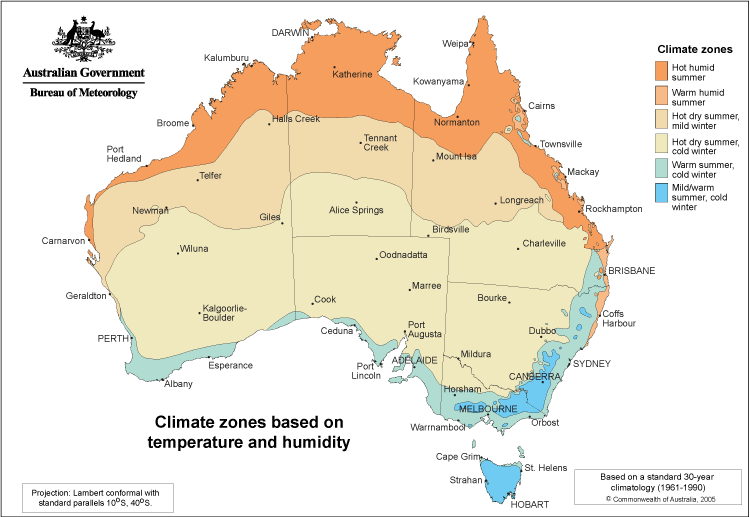 Because Australia, in winter, is much warmer than most of North America in winter, the lowest US zones aren't needed. As a result all of Australia is covered by just over four US zones (8 to 11) which I have attempted to associate with the Bureau's definitions in the table above. The problem locally is that there doesn't appear to be a commonly used set of zone identifiers with which to work. In any case the published zone number is based only on how well they survive the statistically average low temperatures in winter. That can cause problems in choice because, for example, extreme cold, heat or rain events may still kill them, so some risk evaluation is required for each locality rather than just the average conditions. For example, your average summer temperature can limit what grows well in your climate as many tropical plants will not flourish below certain summer temperatures. Yet some plants that come from high elevations in the tropics may stop growing when the temperature around their roots gets above 25°C, and summer heat can be devastating to many plants that don't experience high temperatures in their native lands. Conversely some plants that come from regions where winters are severe go dormant in winter and they will actually not flower (or fruit) well if they do not get a winter chilling (vernalisation). Also some plants may survive in a locality but won't flower if the day length is inappropriate. Humidity is a major climate variable that is particularly important in choosing plants for a Sydney garden. Our humid summers mean that many of the traditional herbaceous perennials that star in English borders tend to rot off during January and February here because their structure of having basal leaves makes them prone to fungal diseases during times of high humidity. For our purposes and in the absence of clearly defined local hardiness zones, the map is useful as a broad guide, then you also need to take into account other local factors including local knowledge of what performs well. Within the zones listed above, altitudes and geographical features have localised affects. Gardens at higher altitudes will be cooler than those at sea level in adjoining areas. Sea breezes can provide a milder climate for coastal areas than those a few kilometres inland, but salt-laden winds can impact on plant growth in these areas. Gardens where cold air can flow away will be less damaged by frost than gardens in valleys or where solid walls block its escape. These variations are known as local microclimates, and you may have to make some adjustments to what you can grow according to these local conditions. As a case in point my own garden in Sydney's north would be described as being in the Warm Temperate zone. But our suburb is situated at one of the higher geographic locations in the Sydney basin so can be a little cooler than average for Sydney with very occasional winter frosts. Therefore autumn tree colour is more distinct and some of the cooler climate shrubs can grow quite well here. The northern high ridge that runs through this area means Sydney's highest annual rainfall region is only 7kms away. Additionally, we are about 20 km from the ocean - far enough away that it has no real mitigating effect against cold winters, nor hot summers. Go a further 20km west and the climate at the base of the Blue Mountains is different again - hotter, drier summers with lower humidity, colder winter mornings with more frosts and less rain. The point about this of course is that when I describe plants that I know, and that thrive in my garden, I am really only talking about my small piece of the planet. To have success with exactly the same plants in your own garden is going to be problematic, and subject to some experimentation.